Newly engaged and eager to start planning your dream wedding? Jumping in head first into local bridal shows are the best way to hit the ground running! However, as planners ourselves, we like to give a little extra bang for your time! 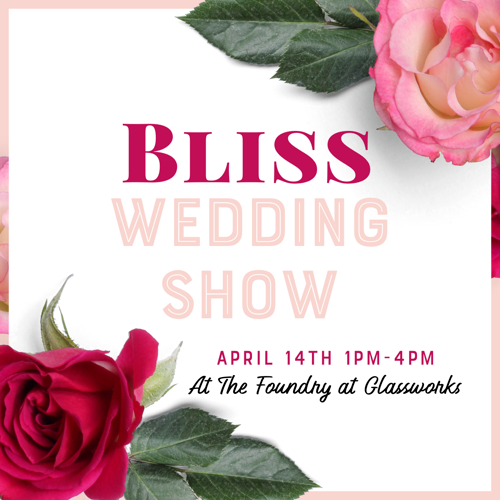 Bliss Wedding Show is not your ordinary wedding show! There is a lot more going on besides meeting vendors! Read below and see why! The Bliss Wedding Show features over 50 displays of the latest must-have wedding products and services. Get ideas and be inspired by the best wedding vendors in the industry. Door prizes every hour. One lucky couple will even win a free honeymoon! Free chair massages! Free gift for the first 50 through the door! Free specialty coffee for all attendees! And of course, cake and food tastings from multiple vendors! "Make me a bride make-over” -Here volunteers will be chosen for a hair and makeup make-overs! Marriage seminars every half hour on topics you will not want to miss - such as Money and Marriage, What makes a successful marriage (and it is more than just "you have to communicate"), What women want, What men want! Vote for your best vendor and your vendor wins bragging rights and if your name is drawn, you win FREE wedding bands! Ticket price includes a free copy of Louisville Bride Magazine! All brides and grooms are free with preregistration and guests are just $2.00! Brides and Grooms that do not wish to register is $25 at the door! Vendor advertising allows this show to be free for you to attend. Vendors will receive your contact details-but you can esily unsubscribe at any time!